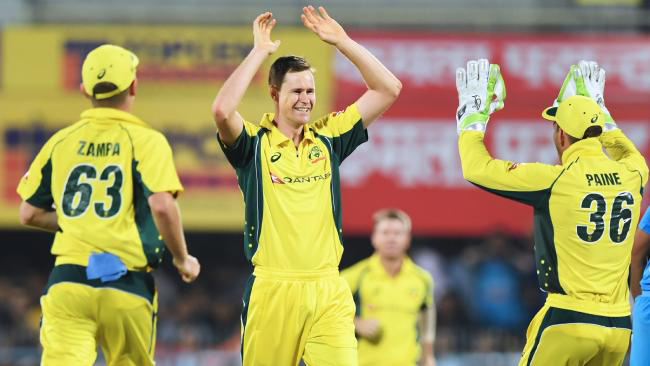 Australia’s Jason Behrendorff, second left, celebrates the dismissal of India’s Rohit Sharma (not in picture). (Reuters) – Australia’s Jason Behrendorff took four wickets for 21 in an inspired spell of fast bowling to set up an eight-wicket win over India in the second Twenty20 international yesterday, squaring the three-match series at 1-1. The touring side, who lost the one-day series 4-1 and the first T20 by nine wickets, reached their target of 119 with 27 balls to spare at the Barsapara Cricket Stadium in Guwahati. Playing only his second international match, the 27-year-old Behrendorff scythed through India’s top order after Australia captain David Warner won the toss and chose to bowl. The left-arm paceman dismissed opening batsman Rohit Sharma and India captain Virat Kohli in his first over and then took the wickets of Shikhar Dhawan and Manish Pandey to reduce the hosts to 27-4 inside the first five overs. “It was unbelievable. Bowling four (overs) upfront doesn’t happen too often and I was lucky to do it,” Behrendorff said during the innings break. India never recovered from the terrible start and were all out for 118 in their 20 overs. Kedar Jadhav scored 27 and Hardik Pandya made 25 in the only notable contributions with the bat for the hosts. Leg-spinner Adam Zampa kept the pressure up on the Indian middle order, picking up two for 19 in his four overs. Australia lost openers Warner and Aaron Finch early in their chase, giving India hope of an unlikely win but Moises Henriques and Travis Head then combined in an unbroken stand of 109 for the third wicket to take them to victory. Henriques hit four sixes and an identical number of boundaries to remain unbeaten on 62 for his second half century in T20. Head was not out on 48 as Australia completed a convincing victory. Hyderabad will host the deciding match of the series on Friday.